CCTV security systems could soon spot an assault on a bus before it happens, according to a major research project. The system, part of which has already been tested in laboratory conditions, looks for suspicious behaviour associated with crime. It would be able to send live CCTV pictures to operation rooms, from where controllers would be able to intervene. The Queens University Belfast team say the software could make a significant impact on crime on transport. Although much of the work is currently at the theoretical stage, the team from the university's newly-founded Centre for Secure Information Technologies predict that within five years their software will be able to profile people as they board a bus. The system would then compare who it thinks these people are, and what they are doing, with more general data on the bus's location, time of day and historic crime rates. Once it has sifted this data, it could be able to conclude whether someone is about to commit an assault and send live pictures to controllers. Dr Paul Miller, head of the research project, said there were millions of CCTV cameras in the UK doing very little to fight crime. 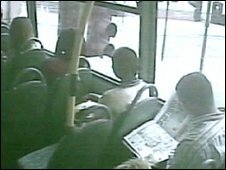 "Their impact on anti-social behaviour and criminal behaviour is negligible - assaults on buses are a major problem and very little CCTV material is analysed in real-time," he said. Dr Miller said the 15-strong team were still developing initial databases to identify an individual's gender and body shape. However, the team say the system goes further by then looking for recognised signs of an imminent criminal offence. These signs include someone moving seats shortly before an assault, groups closing in on a passenger sitting alone and people loitering on a double-decker's stairwell, or close to the driver's cab. The system would only alert a controller if the sum of all of these "atomic events" added up to the profile of a possible crime. "The system won't be able to say, 'this is an incident' - but it will be able to push that video stream to the top of the queue for security analysts [in a control room] to make a decision," said Dr Miller. "Ultimately, most of the events will be benign, with nothing going on. That's why you still need the human element." Dr Miller said that laboratory tests on gender recognition, based on a database of 4,000 faces, had proved successful and the project would move into testing systems on buses over the next year. He conceded that buses were a "pretty challenging environment" for the software - but the benefits could be enormous. "Research shows crimes happen when there is an opportunity and no chance of payback," he said. "If a security analyst can directly communicate with the assailant, to tell them they are being watched, it will have a marked effect on the offender. Just one example of this actually happening can have a deterrent effect on the crime rate in an area." The CCTV project is among research being conducted at the Centre for Secure Information Technology, which has launched this week. CSIT says it aims to be a "leading edge" centre in taking theoretical university work on combating cyber crime and improving security and turning it into practical tools to help police and other security services.